Last week, on Monday, Jan. 21 in the ring-tailed lemur habitat in the Houston Zoo, a tiny (and we mean TINY) baby ring-tailed lemur was born to experienced mom, Cairrean. At an estimated three ounces at birth, the unnamed baby will cling to Cairrean’s chest for a couple of weeks before moving to her back and then will stay clinging to mom until he or she is several weeks old. You can see video of mom and baby below! But wait, there’s more! 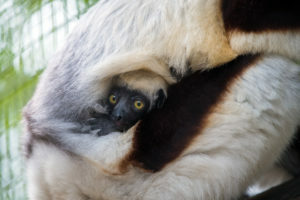 Just before Christmas, on Dec. 23, a male Coquerel’s sifaka baby was born to mom Zenobia. He has been named Dionysius by the primate keepers and is becoming increasingly more confident venturing away from his mother’s back. Coquerel’s sifaka are a species of lemur known for their unusual locomotion called vertical clinging and leaping. While upright, they bounce through the trees using the strength of their hind legs. The Houston Zoo is dedicated to saving animals in the wild, including endangered lemurs. Native only to the small island of Madagascar, lemurs are threatened by deforestation, habitat fragmentation, and hunting. To help save these animals from continued decline, the Houston Zoo partners with a Malagasy (native people of Madagascar) conservation organization based in Madagascar called GERP, a French acronym which translates to Primate Education and Research Program. GERP is comprised of many Malagasy researchers and conservationists that have grown up around the areas where they now work to protect the wildlife and habitat. Not only do they address threats to the animals, they have a clear understanding of the challenges their own local people face as well. In finding solutions that benefit the people and animals, they ensure long-term sustainability and success. 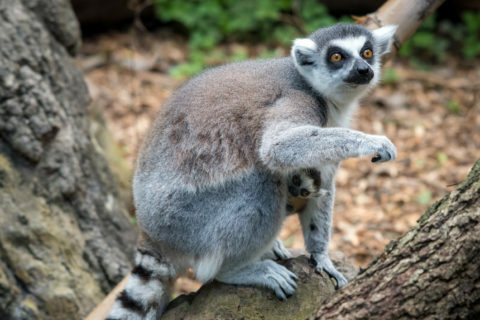 Guests to the Houston Zoo can see ring-tailed lemurs and Coquerel’s sifaka in Wortham World of Primates in the center of the zoo where they can learn all about primates and what they can do to help protect them. People can take action to help save these unique animals by simply being aware of the kind of woods they buy. Many precious woods such as rosewood and ebony are illegally logged from Madagascar’s forest to be made into furniture, musical instruments and other items. Buy locally sourced wood products wherever possible.